Alluvial gold was the main source of gold found and tent cities were a feature of the landscape as miners tried their luck in the creeks surrounding Yackandandah. 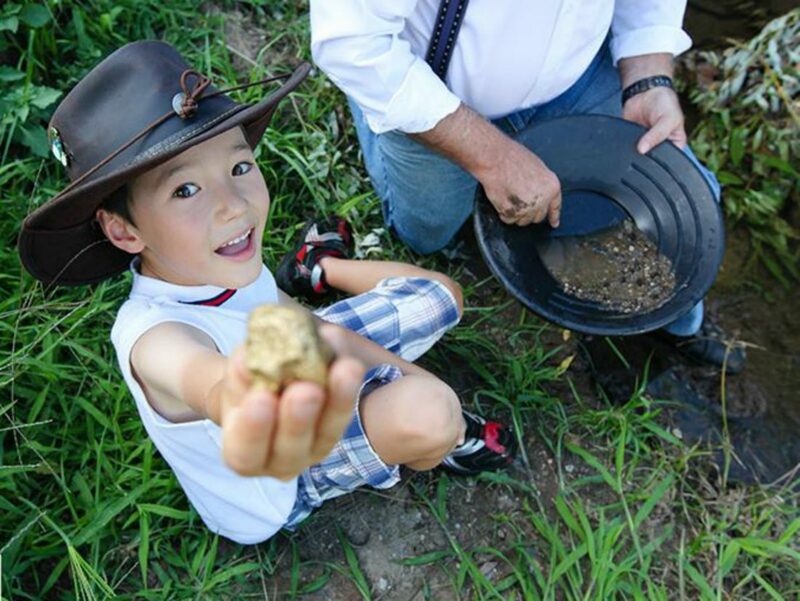 Many people still come to Yackandandah to try their luck and pan for gold. A popular spot is known as The Junction where Clear Creek and Nine Mile Creek join to become Yackandandah Creek. If you are thinking about coming to Yackandandah to prospect, please take note of the following information. All persons who wish to prospect in any form within Victoria must be in possession of a Miners Right. Under 18 year olds do not need a miners right as long as they are in the direct company and supervision of an adult who holds a current miners right. Miners rights are valid for 10 years from the date of purchase. Miners Rights can be purchased from the Beechworth and Yackandandah Visitor Information Centres. Prospecting is permitted in the Yackandandah and Stanley State Forest. Panning is only permitted above The Junction.